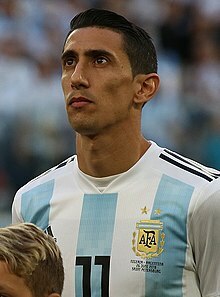 Ángel Fabián Di María (Spanish pronunciation: [ˈaŋxel di maˈɾi.a]; born 14 February 1988) is an Argentine professional footballer who plays for Paris Saint-Germain and the Argentina national team. He can play as either a winger or attacking midfielder. After beginning his career with Rosario Central, Di María moved to Europe in 2007 to play for Benfica, earning a €25 million move to Real Madrid three years later. He played a major role in the club's 2011–12 La Liga triumph. After winning the UEFA Champions League with Real Madrid, he signed for Manchester United in 2014 for a British record £59.7 million, but joined PSG a year later for around £44 million. 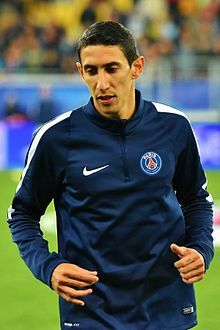 Di María was born on 14 February 1988 in Rosario, Argentina, as one of three children of Miguel and Diana, and grew up in Perdriel. As an infant, he was unusually active, and on recommendation of a doctor was signed up for football at age three. He also helped his parents with their work at a local coal yard along with his two sisters, Vanesa and Evelyn. Due to the low income his family earned, purchasing football boots and keeping up with Di María's hobby was difficult for his parents. He considers himself to be a "family man" and has used a significant amount of his salary to "give back" to his family. After being transferred to Benfica, he asked his father not to work anymore and purchased a house for his parents and sisters. At age four, Di María joined Rosario Central. As he had already committed to playing for his local club, Torito, 35 footballs were given in compensation. Di María made his professional debut on 14 December 2005 in Rosario's final fixture of the Apertura, a 2–2 draw away to Independiente, by replacing Emiliano Vecchio. He scored for the first time on 24 November 2006 in the following season's Apertura in a 4–2 win at home over Quilmes, a minute after replacing Leonardo Borzani at half-time. After playing at the 2007 FIFA U-20 World Cup in Canada, Boca Juniors made a bid of US$6.5 million for him. He was also approached by English club Arsenal, a move that fell through due to the United Kingdom's strict rules on issuing work permits to players from outside the European Union. Di María was transferred to Portuguese side Benfica in July 2007, where he played as a winger. Benfica paid Rosario Central €6 million for 80% of his sports rights and 50% of sports right of Andrés Díaz. Later, in August 2008, the Portuguese club paid an extra €2 million for the remaining 20%, but re-sold 10% to GestiFute. Di María was signed as a replacement for Benfica's departing captain, Simão, who joined Atlético Madrid earlier that summer. Di María signed a new deal with Benfica in October 2009, adding three more years to his current deal, which was to last until 30 June 2015 with his release fee set at a minimum of €40 million. Later that month, he was backed by Diego Maradona to become "Argentina's next superstar". On 27 February 2010, Di María scored his first hat-trick in a classic 4–0 win against Leixões. The next day, he made the headlines as "Magic Tri María" in all sports newspapers in Portugal. On 28 June 2010, Real Madrid posted on their website that they had come to terms with Benfica for the transfer of Di María. He signed a five-year contract for €25 million, plus €11 million in incentives, as announced one day later by the Portuguese Stock Exchange regulating entity. On 7 July 2010, Di María arrived to Madrid directly from Buenos Aires, and passed the medical test on 8 July. He made his debut on 4 August 2010 in a friendly match against Mexican side América, which Real Madrid won 3–2. On 22 August, Di María scored his first goal in another friendly away against Hércules, which Real Madrid won 1–3. In the last match of the pre-season, on 24 August, after an individual play described as a "magic moment", he opened the score of the 2–0 win against Peñarol for the Trofeo Santiago Bernabéu. His league debut came on 29 August in a 0–0 draw against Mallorca. On 18 September, Di María scored his first league goal for Real Madrid in their 1–2 away win over Real Sociedad. Ten days later, he scored his first goal in the UEFA Champions League against Auxerre in a 0–1 victory. He scored a controversial first goal against Sevilla on 19 December. Days later, Di María assisted Karim Benzema's two goals and Cristiano Ronaldo's goal in an astonishing 8–0 drubbing of Levante on 22 December. In the second leg of the Champions League round of 16 against Lyon, he scored the third and final goal in a 3–0 win to send Real Madrid through to the quarter-finals for the first time in seven years. Di María scored Real Madrid's third goal during their first-leg Champions League quarter-final victory over Tottenham Hotspur on 5 April 2011. On 20 April, he was sent off in the 31st minute of extra time in the Copa del Rey final against rivals Barcelona. Real Madrid won the match 1–0, the lone goal of the match (in the 13th minute of extra time) being a header from Cristiano Ronaldo, which came from his cross, thus obtaining his first honour with Real Madrid. During the start of the 2011–12 season, Di María endured a tough series of matches as he struggled to adapt to the pace of the league following the summer break. As a result, Di María's early performance for the season were mixed with moments of genuinely good play interspersed with moments of sheer madness by the Argentine. This point was well illustrated during Real Madrid's 1–0 defeat to Levante, a match which saw a clearly out-of-sorts Di María commit a horror foul on Levante's Juanfran during the match. Di María caused the two teams to clash and an on-field incident ensued. However, Di María's performances would improve, including opening up a significant gap at the top of the assists table. From October 2011, Di María was being picked by Madrid head coach José Mourinho ahead of Kaká and Mesut Özil, a sign of his improving form. On 27 November 2011, Di María played 60 minutes in a league match against city rivals Atlético Madrid, in which he scored a goal for Real Madrid. Mourinho's team won the match 4–1. On 3 December 2011, Di María scored Real's first goal from a sharp angle in a 3–0 defeat of Sporting de Gijón in La Liga. He was a constant threat and presence in the starting XI as Real Madrid won their 32nd league title, playing in their 3–0 win over Athletic Bilbao that clinched the league title. Di María scored his first goal of the season against Barcelona in the first leg of the 2012 Supercopa de España at Camp Nou after a mistake by Barcelona goalkeeper Víctor Valdés. Although Di María did not have the best season, he did contribute in big moments, most notably by sending in the cross for Cristiano Ronaldo's goal against Manchester United on 13 February, in the league he provided quality assists, and scored eight goals throughout the season in 46 appearances, notably against Atlético Madrid and Málaga. On 9 August 2012, Di María signed a new contract with Real Madrid, keeping him at the club until 2018. On 2 October 2013, Di María scored two goals against Copenhagen in Real Madrid's 4–0 Champions League victory over them. Di María was used in a midfield position with the arrival of new manager Carlo Ancelotti. Later in the season, due to managerial decisions by Ancelotti, Di María switched his playing position permanently to an attacking central midfielder and was frequently seen in the starting line-up next to Luka Modrić and Xabi Alonso. He contributed to the club's 1–2 victory over Barcelona in the 2014 Copa del Rey Final with the opening goal. Di María was the top assist maker in La Liga for the season, contributing 17. In the 2014 UEFA Champions League Final against Atlético Madrid on 24 May 2014, Di María dribbled past three players before producing a save from goalkeeper Thibaut Courtois. However, Di María's teammate Gareth Bale, was there to head the rebound into the net in the 110th minute, giving Real Madrid a 2–1 lead over Atlético in an eventual 4–1 win. Di María was named man of the match by UEFA after the match, and was presented with the honour by former Manchester United head coach Sir Alex Ferguson. Di María was an unused substitute as Real Madrid won the 2014 UEFA Super Cup against Sevilla on 12 August. A week later, in the first leg of the Supercopa de España, he played the final 15 minutes of a 1–1 home draw against Atlético Madrid in place of Luka Modrić. On 26 August 2014, Di María signed a five-year deal with Manchester United for a transfer fee of £59.7 million, one of the most expensive transfers of all time and the highest fee ever paid by a British club at the time. He inherited the number 7 shirt at United, which was previously worn by club legends such as George Best, Bryan Robson, Eric Cantona, David Beckham and Cristiano Ronaldo. Di María made his debut on 30 August in a 0–0 draw with Burnley, in which he was substituted for Anderson after 70 minutes. He scored his first goal for United on 14 September, netting directly from a free-kick in a 4–0 win over Queens Park Rangers. He also provided an assist for Juan Mata's goal in the same match, winning the vote for Man of the Match. His performance was highlighted by Sky Sports' Player Cam feature, which was brought back especially for the match. In the next match, against Leicester City on 21 September, he again scored a goal and provided another assist, although United lost the match 5–3. On 2 October, Di María won Manchester United's Player of the Month award for September after recording two goals and two assists in his first four matches for the club. One week later, he won his second individual trophy at United after his goal against Leicester, in which he chipped goalkeeper Kasper Schmeichel, was voted as the club's Goal of the Month for September. Di María continued his run of fine form on 5 October by scoring a goal and providing an assist for Radamel Falcao to help United defeat Everton 2–1. Di María was substituted with a hamstring injury 13 minutes into United's 3–0 defeat of Hull City on 29 November and subsequently made only one substitute appearance in the team's next seven matches. On 4 January 2015, Di María returned from injury to score a late goal in a 0–2 win against Yeovil Town in the third round of the FA Cup. A week later, he was used as a forward by manager Louis van Gaal in a 0–1 home defeat to Southampton. This new role came in the midst of a bad run of form for Di María, who was said to have struggled since October. Di María was sent off on 9 March as United lost 1–2 at home against Arsenal in the FA Cup sixth round, being booked for diving and for grabbing the shirt of referee Michael Oliver, but earlier set up the equaliser by Wayne Rooney. At the season's end, Di María was judged by pundits and journalists to be the worst signing of the season. On 25 July 2015, Di María failed to board a flight to the United States to join Manchester United's pre-season tour as scheduled, with manager Louis van Gaal saying he "did not know why". On 2 August, it was reported Di María would undergo a medical ahead of a move to Paris Saint-Germain, and four days later, Manchester United confirmed he had been sold to the French champions for an undisclosed fee, believed to be around £44 million, signing a four-year contract. Di María made his Ligue 1 debut on 30 August away to Monaco as a 66th-minute substitute for Lucas, and assisted Ezequiel Lavezzi for the final goal of a 0–3 win at the Stade Louis II. On 15 September, Di María scored his first goal for PSG on his UEFA Champions League debut for the club, a 2–0 win over Malmö FF at the Parc des Princes. Seven days later, he registered his first goal in Ligue 1 as PSG defeated Guingamp 3–0. On 23 April 2016, Di María scored the winning goal for PSG in the 2016 Coupe de la Ligue Final against Lille at the Stade de France. Di María ended 2015–16 setting a new Ligue 1 record for assists in a season with 18. In the 2016–17 Champions League group stage home match against Basel on 19 October 2016, Di María scored the opening goal in the 40th minute in a 3–0 victory for PSG to register his first goal of the season. On 19 November, he opened the scoring with his first Ligue 1 goal of the season in a 2–0 home win against Nantes. On 14 February 2017, he scored a brace as PSG defeated Barcelona 4-0 in the first leg of Champions League round of 16 at the Parc des Princes. On 1 April, he scored in PSG's 4–1 win over Monaco in the 2017 Coupe de la Ligue Final. On 8 May 2018, he played as PSG won 2-0 against Les Herbiers VF to clinch the 2017–18 Coupe de France. In 2007, Di María was picked to play for the Argentina under-20 squad. He was capped for the 2007 South American Youth Championship in Paraguay. In 2007, he was called up for the 2007 FIFA U-20 World Cup in Canada. They went on to win the tournament with Di María scoring three goals in the process. On 28 January 2008, Di María and some of his under-20s teammates were called up for the Argentina squad for the 2008 Beijing Olympics. He scored the extra-time game-winning goal on a pass from Lionel Messi in the 105th minute of his team's 2–1 quarter-final win over the Netherlands. On 23 August, Di María scored the game-winner – a chip over the goalkeeper from the edge of the area – in the 57th minute of Argentina's 1–0 victory against Nigeria to capture their second-straight Olympic gold medal in the final game of the Olympic tournament. On 6 September 2008, Di María made his debut for the Argentina senior team in a match against Paraguay. On 19 May 2010, Di María was selected by Argentinian manager Diego Maradona as one of a 23-man squad for the 2010 FIFA World Cup in South Africa. In Argentina's 5–0 friendly win over Canada on 24 May, Di María scored his first ever international goal, scoring from outside the box as his shot went off the post and in. He helped the side reach the quarter-finals, playing in all five of Argentina's matches and starting four of them. Following the World Cup, on 11 August 2010 Di María scored the first ever international goal at Dublin's new Aviva Stadium in a friendly against the Republic of Ireland as Argentina won 0–1. Di María appeared three times during the 2011 Copa América, scoring once in a 3–0 defeat of Costa Rica in the group stage. Di María made 12 appearances during the 2014 FIFA World Cup qualification campaign and was named in Argentina's squad for the tournament finals. In Argentina's round of 16 match against Switzerland, Di María scored the only goal of the game after 118 minutes, from a Lionel Messi assist. During the quarter-final match against Belgium, Di María suffered a muscle tear in the thigh and was later taken off the field. It was later announced after the match that Di María would miss the rest of the tournament due to the injury. He had previously helped to create Gonzalo Higuaín's only goal of the match, which sent Argentina into the semi-finals. Argentina finished the tournament as runners-up to Germany. On 11 July, Di María was named on the ten-man shortlist for FIFA's Golden Ball award for the tournament's best player. On 3 September 2014, in a friendly away against world champions Germany, Di María had a part in all four of Argentina's goals in a 2–4 victory, assisting three and scoring one. On 28 May 2015, Di María was named in Argentina's squad for the 2015 Copa América. On 6 June, he was selected to captain the team in the absence of Lionel Messi for a warm-up match against Bolivia, scoring twice in a 5–0 win. A week later, in their opening match of the tournament against Paraguay in La Serena, Di María won a penalty which Messi scored in a 2–2 draw. On 30 June, he scored twice and assisted a goal for Sergio Agüero, as Argentina defeated Paraguay 6–1 to reach the final. He was substituted with a hamstring injury within the first half-hour of the final against hosts Chile, which his team lost in a penalty shootout after a goalless draw. In Argentina's opening match of the Copa América Centenario on 6 June 2016, a rematch of the previous tournament's final against defending champions Chile, Di María scored the opening goal of the match, and later assisted Éver Banega's goal in a 2–1 win. Di María dedicated the goal to his grandmother, who had recently died. In his nation's second group match, against Panama on 10 June, he assisted Nicolás Otamendi's opening goal, but was later forced off due to injury. Argentina won the match 5–0. He missed the rest of the tournament due to injury as Argentina reached the Copa América final for the second consecutive time, once again losing out to Chile on penalties, following a 0–0 draw. Di María made 18 appearances in the 2018 FIFA World Cup qualification campaign. On 22 May 2018, Di María was named in 23-man squad by manager Jorge Sampaoli for the 2018 FIFA World Cup in Russia. On 30 June, he scored a long range goal against France in a 4–3 defeat which saw Argentina eliminated from the World Cup in the Round of 16. Di María is a quick, tricky and talented winger who is also capable of playing as a more central attacking midfielder or on either side of the pitch, although he is predominantly a left-footed player. In recent years, he has even been deployed to great effect as a central midfielder, in particular under Carlo Ancelotti's tenure with Real Madrid. Di María is an agile, creative and highly technical player who possesses excellent dribbling skills and ball control, as well as great pace, stamina and acceleration, attributes which allow him to beat players easily in one-on-one situations. He is also gifted with excellent vision, set-piece delivery, passing, and crossing ability, which allow him to function effectively as a playmaker and as an assist provider, although he is also capable of scoring goals himself. Despite not being physically imposing, he is also a very hard-working player, and he improved on the defensive aspect of his game under manager José Mourinho. Di María is nicknamed "Fideo", which means "noodle" in Spanish, due to his slender frame. He holds an Italian passport, because he has Italian ancestry. He married fellow Argentine Jorgelina (née Cardoso) in 2011. Together they have a daughter, Pia, who was born three months premature and survived after treatment at an intensive care unit at the Hospital Universitario Montepríncipe in Madrid. Di María's home in Prestbury, Cheshire, was the scene of an attempted burglary on 31 January 2015. ^ "Ángel Di María". psg.fr. Paris Saint-Germain FC. Retrieved 12 April 2019. ^ a b "Angel Di Maria to Manchester United: Winger was once sold for 35 footballs – now it's £60m". 25 August 2014. Retrieved 27 August 2014. ^ "The man who doesn't run alone". ESPN. 2 June 2014. Retrieved 4 September 2014. ^ "Cuatro goles para despedir el campeonato" [Four goals to see off the championship] (in Spanish). ESPN. 14 December 2005. Retrieved 28 August 2014. ^ "En casa es mucho mejor" [At home it's a lot better] (in Spanish). ESPN. 24 November 2006. Retrieved 28 August 2014. ^ a b "A Boca "le soplaron" a Di María por la misma plata" [Boca "blew at" Di María for the same money] (in Spanish). Infobae. 27 July 2007. Retrieved 28 August 2014. ^ "Arsene Wenger: Visa denied Arsenal's Angel Di Maria move". BBC Sport (British Broadcasting Corporation). 23 January 2015. Retrieved 25 January 2015. ^ "Sport Lisboa e Benfica – Futebol, SAD announces an agreement in principle for the acquisition of Andrez Dias and Angel Di María" (PDF). SL Benfica (in Portuguese). Published by CMVM. 27 July 2007. Retrieved 4 October 2010. ^ "Sport Lisboa e Benfica – Futebol SAD announces acquiring the remaining 20% of Di Maria's economic rights" (PDF). SL Benfica (in Portuguese). Published by CMVM. 13 August 2008. Retrieved 4 October 2010. ^ "Di Maria e a renovação: "É uma motivação mais."" (in Portuguese). SL Benfica. 2 October 2009. Retrieved 8 October 2009. ^ "Chelsea transfer target Angel Di Maria will be a worldwide superstar, says Diego Maradona". Mirror Football. Trinity Mirror. 28 October 2009. Retrieved 28 October 2009. ^ "10 things you need to know about Liverpool target Angel De Maria". Mirror Football. Trinity Mirror. 17 September 2009. Retrieved 1 July 2010. ^ "Official announcement" (PDF) (in Portuguese). CMVM – Portuguese Securities Market Commission. 28 June 2010. Retrieved 16 July 2010. ^ "Di Maria arrives in Madrid". realmadrid.com. Real Madrid CF. 7 July 2010. Archived from the original on 9 July 2010. Retrieved 7 July 2010. ^ "Di Maria passes physical". realmadrid.com. Real Madrid CF. 8 July 2010. Archived from the original on 11 July 2010. Retrieved 8 July 2010. ^ The Whites win first preseason match Archived 19 September 2010 at the Wayback Machine realmadrid.com, 5 August 2010. ^ Hercules v Real Madrid – Goal.com Goal.com, 23 August 2010. ^ Real Madrid 2–0 Penarol: Hosts Win Sixth Successive Trofeo Santiago Bernabéu – Goal.com Goal.com, 25 August 2010. ^ Report: Mallorca v Real Madrid – Spanish Primera División – ESPN Soccernet soccernet.espn.com, 30 August 2010. ^ Report: Real Sociedad 1 – 2 Real Madrid soccernet.espn.go.com, 19 September 2010. ^ Report: AJ Auxerre 0 – 1 Real Madrid goal.com, 28 September 2010. ^ Bryan, Paul (16 March 2011). "Jubilant Madrid breeze past Lyon". UEFA.com. Union of European Football Associations. Retrieved 26 August 2014. ^ Bryan, Paul (5 April 2011). "Majestic Madrid sweep Tottenham away". UEFA.com. Union of European Football Associations. Retrieved 26 August 2014. ^ "Ronaldo's late goal gives Real Madrid win over Barcelona in Copa del Rey". The Guardian. Guardian News and Media. 21 April 2011. Retrieved 26 August 2014. ^ "Real Madrid ease past Sporting Gijon 3–0". IBN. 3 December 2011. Retrieved 26 August 2014. ^ "Real Madrid win La Liga title with victory over Athletic Bilbao". BBC Sport (British Broadcasting Corporation). 2 May 2012. Retrieved 26 August 2014. ^ "The seven best Di Maria moments at Real Madrid". Goal. 26 August 2014. Retrieved 26 August 2014. ^ "Real Madrid 1–1 Manchester United". BBC Sport (British Broadcasting Corporation). 13 February 2013. Retrieved 25 May 2014. ^ "Di Maria extends Real Madrid contract until 2018". Goal.com. 9 August 2012. Retrieved 7 July 2014. ^ Jenson, Pete (2 October 2013). "Ronaldo hits double in Real Madrid romp to make it a staggering 212 goals in 208 games". Daily Mail. Retrieved 25 May 2014. ^ "Barcelona 1–2 Real Madrid". BBC Sport (British Broadcasting Corporation). 16 April 2014. Retrieved 17 April 2014. ^ "Spanish La Liga stats: Assists leaders – 2013–14". ESPN FC. ESPN Internet Ventures. Retrieved 17 May 2014. ^ Yorke, Graeme (25 May 2014). "Sir Alex Ferguson presents Angel Di Maria with man-of-the-match award... hours after wine collection sells for over £2MILLION!". Daily Mail. Retrieved 25 May 2014. ^ Phillips, Rob (12 August 2014). "Super Cup: Cristiano Ronaldo scores twice in Real Madrid win". BBC Sport (British Broadcasting Corporation). Retrieved 13 August 2014. ^ Todd, Oliver (19 August 2014). "Real Madrid 1–1 Atletico Madrid MATCH REPORT: James Rodriguez scores after replacing injured Cristiano Ronaldo but Raul Garcia levels to make it advantage Atletico ahead of Super Cup second leg". Daily Mail. Retrieved 28 August 2014. ^ Jackson, Jamie (26 August 2014). "Ángel di María completes record £59.7m move to Manchester United". The Guardian. Retrieved 26 August 2014. ^ Hirst, Paul (26 August 2014). "Angel di Maria to Manchester United: Premier League club sign Argentine winger in record £59.7m deal". The Independent. Retrieved 26 August 2014. ^ Ogden, Mark (26 August 2014). "Ángel di María signs for Manchester United in £59.7 million deal". The Telegraph. Retrieved 26 August 2014. ^ McDonnell, David (29 September 2007). "Cristiano Ronaldo exclusive". The Mirror. Retrieved 2 September 2014. ^ Ogden, Mark (30 August 2014). "Angel Di Maria makes his Premier League debut". The Telegraph. Retrieved 30 August 2014. ^ a b "Manchester United click again as they crush Queens Park Rangers". Sky Sports. 14 September 2014. Retrieved 14 September 2014. ^ "Man Utd 4–0 QPR". Premier League. 14 September 2014. Retrieved 14 September 2014. ^ Bate, Adam (14 September 2014). "Angel di Maria shows why he can be the difference maker for Manchester United in emphatic 4–0 win over QPR". Sky Sports. Retrieved 17 September 2014. ^ Lewis, Aimee (21 September 2014). "Leicester 5–3 Man Utd". BBC Sport (British Broadcasting Corporation). Retrieved 14 October 2014. ^ Thompson, Gemma; Tuck, James (2 October 2014). "Di Maria wins Player of the Month prize". ManUtd.com. Manchester United. Retrieved 14 October 2014. ^ Tuck, James (9 October 2014). "Di Maria wins Goal of the Month award". ManUtd.com. Manchester United. Retrieved 21 February 2015. ^ Henson, Mike (5 October 2014). "Man Utd 2–1 Everton". BBC Sport (British Broadcasting Corporation). Retrieved 14 October 2014. ^ "Yeovil 0–2 Man Utd". BBC Sport (British Broadcasting Corporation). 4 January 2015. Retrieved 5 January 2015. ^ "Man Utd 0–1 Southampton". BBC Sport (British Broadcasting Corporation). 11 January 2015. Retrieved 23 January 2015. ^ Stanger, Matthew (2 March 2015). "Why is Angel di Maria struggling to discover his best form for Manchester United this season?". Sky Sports. Retrieved 2 March 2015. ^ "Manchester United 1–2 Arsenal". BBC Sport. 9 March 2015. Retrieved 9 March 2015. ^ McDonnell, David (9 March 2015). "Louis van Gaal: Angel Di Maria can have 'no excuses' over red card in Man United's loss to Arsenal". Mirror Football. Retrieved 10 March 2015. ^ "20 worst Premier League signings of the 2014/15 season". The Daily Telegraph. 4 June 2015. Retrieved 4 November 2015. ^ "Angel Di Maria not on flight to join up with Man United on tour". ESPN FC. 25 July 2015. Retrieved 1 August 2015. ^ Stone, Simon (2 August 2015). "Angel Di Maria: Man Utd winger set for Paris St-Germain medical". BBC Sport. British Broadcasting Corporation. Retrieved 2 August 2015. ^ Marshall, Adam (6 August 2015). "Manchester United completes sale of Angel Di Maria to Paris-Saint Germain". ManUtd.com. Manchester United. Retrieved 6 August 2015. ^ "Angel Di Maria". psg.fr. Paris Saint-Germain. Archived from the original on 19 August 2017. Retrieved 19 August 2017. ^ "Monaco 0–1 Paris St G". BBC Sport. 30 August 2015. Retrieved 31 August 2015. ^ "Angel Di Maria scores first PSG goal in Champions League win against Malmo". ESPN. 15 September 2015. ^ "Ángel Di María on target as Paris Saint-Germain beat Guingamp". The Guardian. 23 September 2015. ^ "Paris St-Germain beat Lille 2-1 in the Coupe de la Ligue final". BBC. 23 April 2016. ^ "Di Maria sets new Ligue 1 record with 18 assists". Goal.com. 14 May 2016. ^ "Paris Saint-Germain vs Basel, 2016–2017 UEFA Champions League Group stage". www.goal.com. 19 October 2016. ^ "Ronaldo decides Madrid derby, Dortmund beat Bayern". www.uefa.com. 19 November 2016. ^ "AS Monaco 4-1 Paris Saint-Germain". Ligue 1. 1 April 2017. ^ Begley, Emlyn (8 May 2018). "French Cup final - PSG beat Les Herbiers". BBC Sport. Retrieved 12 April 2019. ^ "Argentina's joy of six". FIFA.com (Fédération Internationale de Football Association). Retrieved 27 August 2014. ^ "Argentina 2:1 Netherlands". FIFA.com (Fédération Internationale de Football Association). 16 August 2014. Retrieved 27 August 2014. ^ "Olympics: Di Maria winner earns gold for Argentina". The Guardian. Guardian News and Media. 23 August 2008. Retrieved 27 August 2014. ^ a b "Angel DI MARIA". FIFA.com (Fédération Internationale de Football Association). Retrieved 2 July 2014. ^ "World Cup 2010: Argentina Squad – Maradona Announces Final 23-Man Roster". Goal. 19 May 2010. Retrieved 26 August 2014. ^ "Argentina 5 Canada 0: match report". The Telegraph. Telegraph Media Group. 24 May 2010. Retrieved 26 August 2014. ^ "Angel Di Maria". FIFA.com. Fédération Internationale de Football Association. Retrieved 26 August 2014. ^ "Republic of Ireland 0–1 Argentina". RTÉ Sport. 11 August 2010. Retrieved 11 August 2010. ^ "Argentina 3–0 Costa Rica: Batista finally changes system, and Argentina progress". Zonal Marking. 12 July 2011. ^ "Argentina World Cup 2014 squad". The Telegraph. 2 June 2014. Retrieved 2 July 2014. ^ "Argentina 1–0 Switzerland". BBC Sport (British Broadcasting Corporation). 1 July 2014. Retrieved 2 June 2014. ^ "Argentina's Ángel di María ruled out of World Cup with thigh injury". The Guardian. Guardian News and Media. 5 July 2014. Retrieved 27 August 2014. ^ "Germany 1–0 Argentina". BBC Sport (British Broadcasting Corporation). 13 July 2014. Retrieved 27 August 2014. ^ "World Cup 2014: Fifa announces Golden Ball shortlist". BBC Sport (British Broadcasting Corporation). 11 July 2014. Retrieved 12 July 2014. ^ "Germany 2–4 Argentina: Angel di Maria shows his £60m class with three assists and stunning goal to crush world champions". Daily Mail. 3 September 2014. Retrieved 4 September 2014. ^ "Argentina's Copa America squad includes Man United's Angel Di Maria". ESPN. 28 May 2015. ^ "Sergio Aguero and Angel Di Maria score in Argentina win over Bolivia". BBC. 7 June 2015. ^ "Argentina 2–2 Paraguay". BBC Sport. 14 June 2015. Retrieved 14 June 2015. ^ Emons, Michael (1 July 2015). "Argentina 6–1 Paraguay". BBC Sport. Retrieved 1 July 2015. ^ Hill, Tim (5 July 2015). "Chile win Copa América after beating Argentina on penalties – as it happened". The Guardian. Retrieved 5 July 2015. ^ "Argentina top Chile in rematch of last year's Copa América final". The Guardian. 7 June 2016. Retrieved 7 June 2016. ^ "Lionel Messi scores brilliant hat-trick as Argentina surge into quarter-finals". The Guardian. 11 June 2016. Retrieved 11 June 2016. ^ David Manuca (24 June 2016). "Di Maria in serious doubt for Copa America final". Goal.com. Retrieved 17 July 2016. ^ "Lionel Messi retires from Argentina after Copa America final loss to Chile". ESPN FC. 27 June 2016. ^ "Sampaoli names 23-man provisional squad". FIFA.com. Retrieved 1 July 2018. ^ "Argentina vs. France highlights: Di Maria, Pavard exchange best goals of the World Cup". CBSSports.com. Retrieved 1 July 2018. ^ Pickup, Oliver (25 August 2014). Angel Di Maria: 15 things you should know about the Manchester United target. The Daily Telegraph. Retrieved on 24 December 2014. ^ "Gareth Bale set for central midfield role at Real Madrid as Carlo Ancelotti seeks to rebalance his side after selling Angel Di Maria". Daily Mail. Associated Newspapers. Retrieved 7 November 2014. ^ "Angel Di Maria – Caratteristiche Tecniche" (in Italian). canalejuve.it. Archived from the original on 7 November 2014. Retrieved 7 November 2014. ^ Musa Okwonga (24 October 2014). "Angel Di Maria holds the key to defeating Chelsea's midfield". ESPN FC. Retrieved 25 July 2016. ^ Gadd, Michael; Scott, Charlie (24 August 2014). "Real Madrid midfielder Xabi Alonso says goodbye to Angel Di Maria on Twitter and Instagram – wishing the Argentine luck 'even at Manchester United'". Daily Mail. Retrieved 28 August 2014. ^ Sheen, Tom (29 August 2014). "Marcos Rojo: Why is it taking so long for Manchester United to get a work permit?". The Independent. Retrieved 30 August 2014. ^ "Fabian Di Maria, stella del Benfica - Corriere dello Sport.it". Archived from the original on 14 July 2014. Retrieved 18 November 2015. ^ a b "Angel Di Maria: 15 things you should know about the Manchester United target". The Telegraph. 25 August 2014. Retrieved 26 August 2014. ^ "Di Maria: Real Madrid circulated 'lies'". ESPN FC. ESPN Internet Ventures. 26 August 2014. Retrieved 26 August 2014. ^ "Man Utd's Angel Di Maria house targeted by burglars". BBC News (British Broadcasting Corporation). 1 February 2015. Retrieved 2 February 2015. ^ Ángel Di María at Soccerway. Retrieved 8 November 2016. ^ "Ángel Di María". National Football Teams. Retrieved 31 December 2014. ^ Ángel Di María at Soccerway. Retrieved 7 June 2016. ^ "Chile 0–0 Argentina (Chile win 4–1 on penalties)". BBC Sport. 5 July 2010. Retrieved 5 July 2015. ^ "UEFA.com users' Team of the Year 2014 revealed". UEFA.com. Union of European Football Associations. 9 January 2015. Retrieved 9 January 2015. ^ "Di Maria's lob against Leicester City voted as Premier League's goal of the season". Goal.com. 5 June 2015. Retrieved 6 June 2015. ^ "Zlatan Ibrahimovic scoops record third Ligue 1 Player of the Year award". 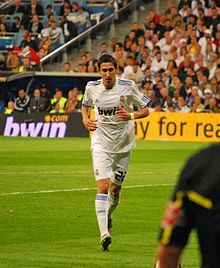 Wikimedia Commons has media related to Ángel Di María.